For decades after the creation of the world’s first professional league in England in 1888, British football remained insular, sure of its superiority over the rest of the world. The arrogance of the game’s authorities and their isolationist stance was perfectly captured by FA committee member, Charles Sutcliffe, in refusing to accept an invitation to enter the 1934 World Cup: “the national associations of England, Scotland, Wales and Ireland have quite enough to do in their own International Championship which seems to me a far better World Championship than the one to be staged in Rome”. The home nations studiously ignored the first three World Cup tournaments organised by FIFA (in 1930, 1934 and 1938); European club competition was not introduced until the mid-1950s. Therefore the visit of top Soviet side Dynamo Moscow in November 1945 was a sensation even before they set foot in the country. 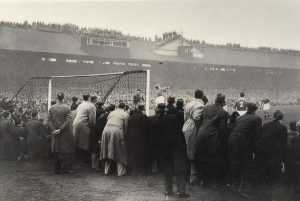 The Soviet team, augmented by players from other top clubs, were unbeaten in their four friendly matches against Chelsea, Cardiff, Arsenal and Rangers, where every stadium was packed. The British teams too added ‘guest players’, including Stanley Matthews, to compete against what was then a completely unknown quantity. England centre-forward Tommy Lawton, newly signed by Chelsea for a record fee, recalled that “The Dynamo were one of the fastest teams I have ever seen in my life”, and was further impressed by their style of play: “The Russians do not dribble. They flash the ball from man to man in bewildering fashion, often while standing still.” The British were also intrigued by Dynamo’s introduction of a ten-minute warm-up before a match, previously unheard of, but soon copied by domestic clubs. The tour was not only a footballing success, but a diplomatic and public relations exercise. Dynamo captain Mikhail Semichastny spoke warmly not only of the ability of the home players, but the spectators and stadia: “British football fields leave a wonderful impression.” He further noted that “We were given a very warm welcome in Scotland and Wales. We were taken to see industrial enterprises, meet miners, see the docks and ports, and wherever we met the people we were warmly greeted.” The Welsh leg of the tour was organised for political rather than football purposes, Cardiff being at the time in the Third Division South. At Ninian Park on the 17th November 1945, Dynamo Moscow duly produced a masterclass in a 10-1 victory.